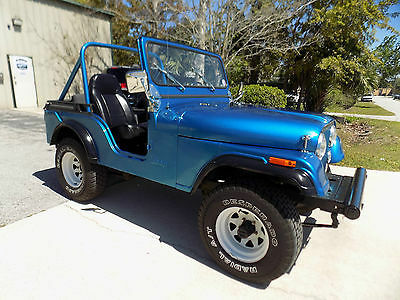 Up for sale is my Beautiful 1976 Jeep CJ 5 . 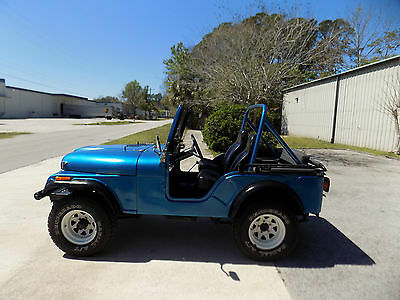 Its a 2 owner jeep from new and has only traveled 58 k miles. The Jeep is very solid and looks excellent. The Jeep was Originally Red and was painted bright blue over 10 years ago . It still looks great and has a nice shine . It does have normal wear and chips etc. The frame is super solid as is the suspension. The interior is excellent The front seats are black vinyl and look new. They are very soft and comfortable. The rear seat is the Original cloth seat and also still excellent. The floors are super solid and were undercoated. The 232 6 cylinder engine is great. It starts right up and runs amazing. The previous owner spent $ 1200 dollars on having it gone through. Here is what was done.New Battery , New tune up including wires , cap and rotor , plugs . New Radiator hoses, new valve cover gasket. He had the carburetor rebuilt and also it has a new air cleaner. The engine is bone dry and looks excellent and it runs excellent. The engine has great power and the 3 speed manual shifts easily through the gears. The tires are newer and they are 31x 15 s . The brakes feel good as well. Inside you will notice a beautiful New Sony CD player with new speakers and antenna. It sounds great and has a remote and blue tooth capability. 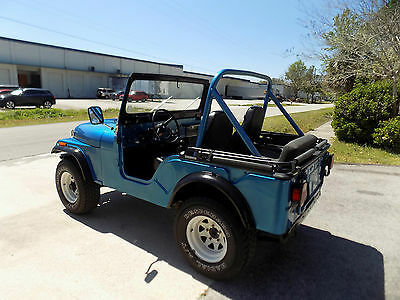 So spring is almost here and these older CJ 5s are harder to find and in this condition. Its very original and it looks great. 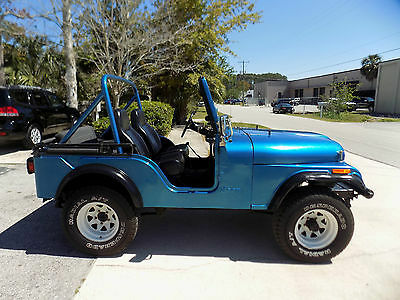 I am setting a very low reserve as I know this jeep will make someone very happy. Its ready to be enjoyed on the beach or mud terrains. Please read my feedback as I take pride in selling great cars and trucks. I have clear title , keys and service on this jeep. If you have any questions please feel free to call me at 954-464-3515 I am relisting due to a non paying buyer please do not bid unless you have funds . Note.. The soft top is brand new as are the doors . it will come with everything shown and described.